In December 2017, McIntosh announced the flagship XRT2.1K nanocarbon-driver technology loudspeaker, a ground-breaking statement product that set new standards for audio performance from the New York factory. Today, the company has introduced the XRT1.1K Loudspeaker, a smaller, lighter and much easier to place version of its flagship sibling and one that’s less than half the price! The XRT1.1K scales down the innovative technology and engineering unveiled in the XRT2.1K and has been designed to fit with ease in a much wider range of environments. At 78kg lighter and 35cm shorter than its sibling, the new XRT1.1K makes the advanced technologies in its bigger brother more home-friendly. A multi-driver design, the XRT1.1K uses a total of 70 individual drivers consisting of four bass drivers, two low-frequency mid-range drivers, plus an incredible 24 upper-frequency mid-range drivers and 40 tweeters. The bass driver and low-frequency midrange driver technology from the XRT2.1K has been directly incorporated into the XRT1.1K, with the high-performance drivers housed in their own dedicated bass enclosure cabinet, located behind the line array. The XRT1.1K’s design, a 4-way ported arrangement, skilfully uses McIntosh’s line array driver configuration to yield a wide and even sound field, producing exceptional stereo imaging in nearly all listening positions. 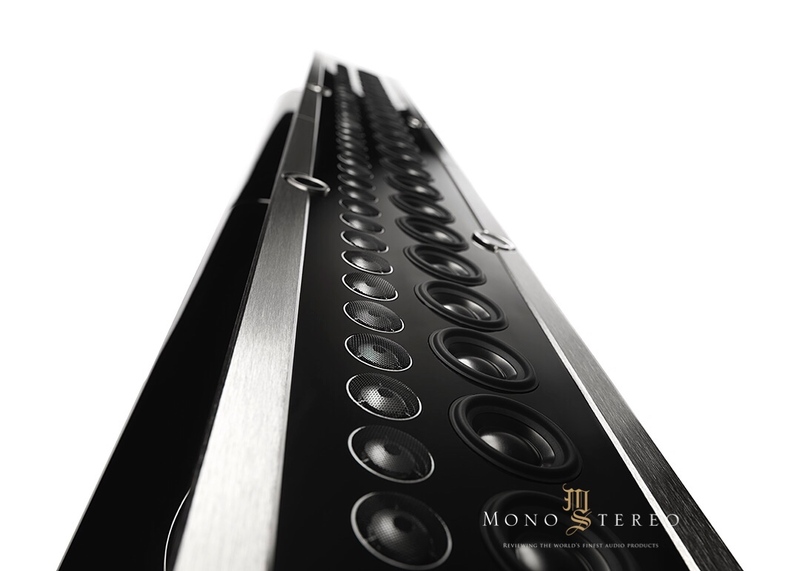 With McIntosh’s line array design, listeners closer to the XRT1.1K will not be overpowered by extremely high volumes as they will only be on-axis to a portion of the drivers; listeners farther away will be on-axis to more of the drivers and will be able to easily hear the music without any large drop-off in sound level or quality. Like the XRT2.1K, the XRT1.1K looks as striking as it sounds. The bass cabinet is finished with seven layers of high-gloss piano black paint and has touches of brushed and black aluminium. The line array features hints of the classic McIntosh front panel with a black centre section and silver trim. It is suspended in front of the bass cabinet via steel spiders that are inspired by modern skyscraper construction; they are capped with magnetic covers that mimic the look of McIntosh control knobs. 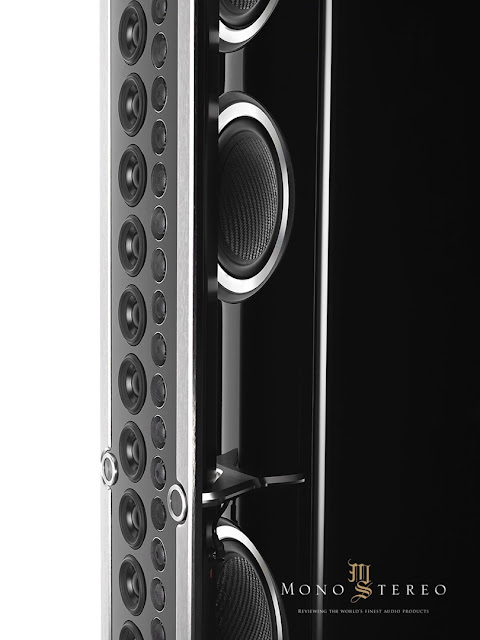 The speaker grilles feature black-knit cloth with high-gloss trim; the grilles are easily removed via magnetic fasteners to expose the drivers. The base plate is made of machined aluminium and glass. 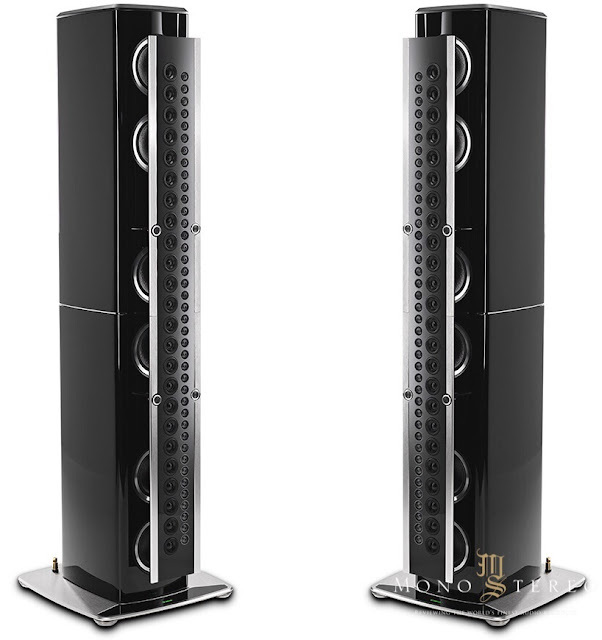 It has four adjustable feet that allow the speaker to make perfect contact with the floor, thus eliminating a possible source of distortion or vibration amplifiers and other products. Utilising capacitors and inductors with low loss and high current capacity, the crossover network is engineered to ensure an even frequency response over the entire audible range. The type of inductor used in each section of the network has been specially chosen for high linearity, even at high power levels. This prevents distortion of the music at any frequency. The network also employs self-resetting high current PTC-type fuses to provide an extra measure of driver protection.